Author’s grouping of 15 rounds at seven yards on a 6″ target. I see a lot of guns on a daily basis. Either in the armory here at home or at work in a boutique-style gun shop and indoor range. After a while they all start to look the same and suddenly the masters I remember from my youth seem a little less impressive. After you’ve handled a couple dozen, for the most part they really stop impressing you. It’s as if the engineers simply stopped trying and just alter an existing design just enough to make it their brand before the factories start stamping them out in masses. For most people that’s just fine. All we’re looking for is a device to fling lead farther and faster than we can throw it and in a predictable manner so we can defend ourselves, enjoy some shooting time, or compete against others. Every now and again a design comes along that changes things. We thought the Arsenal 2011 might be that with it’s simultaneously firing barrels, but in the end it turned out to simply be an expensive pair of 1911s smashed together. The Xcalibur from Grand Power IS different. With the craftsmanship of a hand-assembled piece of art the gun inspires one to pause and drool for a bit. 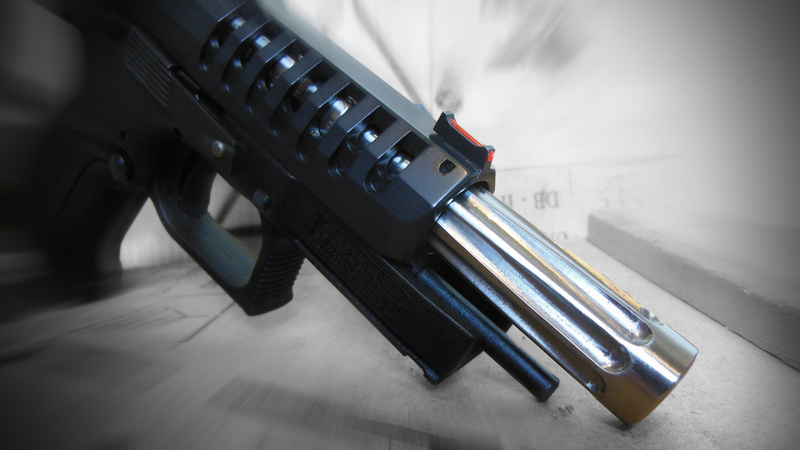 Each piece of steel is machined, not cast, then hand fitted by an armorer. One gun, one armorer, with his initials stamped in the gun. The machining is top notch, as you’d expect to find on an expensive automobile; a refreshing contrast to the stamped and smashed bulk items we’re used to seeing. I can’t count how many times I’ve disassembled the pistol just to show people the polish on the fluted bull barrel; a mirror finish! The parts glide so easily it almost feels like it’s missing something, so smooth is the action that it’s almost inconceivable that with each working of the slide and trigger dozens of smaller parts are all moving in harmony. Shooting the Xcalibur is just as novel of an experience. The recoil is so light and smooth. In fact “smooth” is the word that best describes the functioning of the firearm. 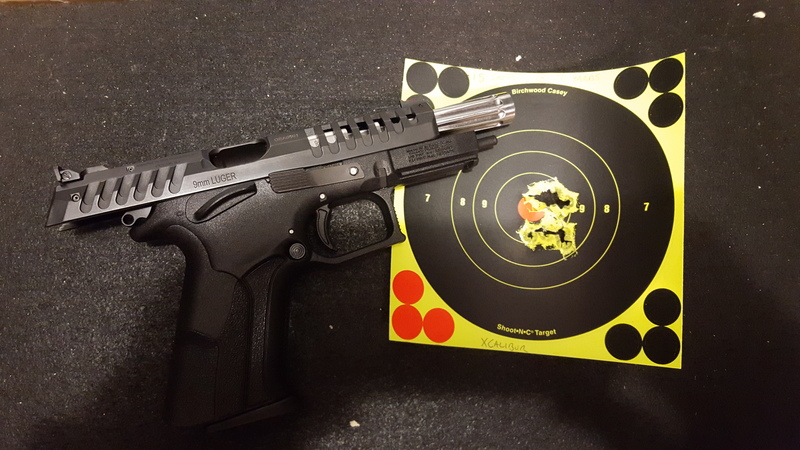 After each shot you’re left questioning if everything worked ok because it lacks the violent recoil impulse and jarring of the hand that many have come to expect from firing such a light-weight pistol. The precision with which each round finds its target also causes a bit of a paradigm shift. Previously there was ammunition that I would avoid using when trying to make a tight group, but the Xcalibur seems to treat them all the same and provides unbelievable groupings regardless of the ammunition used. It truly is an impressive firearm. < Previous What Triggers You? Hi Graham, You asked my son David and I to give you a review on the X-Cailbur when you worked at Threat Dynamics. We both were simply amazed upon firing the first round and replied ‘It shot itself’. We never got over it. I purchased one for my primary firearm last summer. Consistently hitting 6/10 shots at 75 yds. Hit one out of three shots at 87yds. on a 4×5 post. My wife says it is so smooth that she could shoot it all day. Being left eye dominant I reluctantly switched to left-handed one week before my NRA Basic Pistol Instructor Certification course. My first time shooting left-handed, without any live-fire target practice that week, the X-Calibur gave me the tightest groupings of all 14 students, of which the majority were firearm instructors, ex-military and LE. What an amazing an amazing firearm.